Shares of Philip Morris International (NYSE:PM) have tumbled about 20% so far this year as concerns about slower shipments, tighter regulations, rising interest rates, a stronger dollar, and fresh competition from British American Tobacco's (NYSE: BTI) takeover of Reynolds American weighed down the stock. That sell-off has boosted PMI's forward dividend yield to 5.4%, and reduced its forward P/E to 16. Should investors consider PMI an undervalued income stock at these levels, or will the stock continue its decline? How sustainable is PMI's dividend? PMI was spun off from Altria (NYSE:MO) a decade ago, and it's raised its dividend every year since the split. 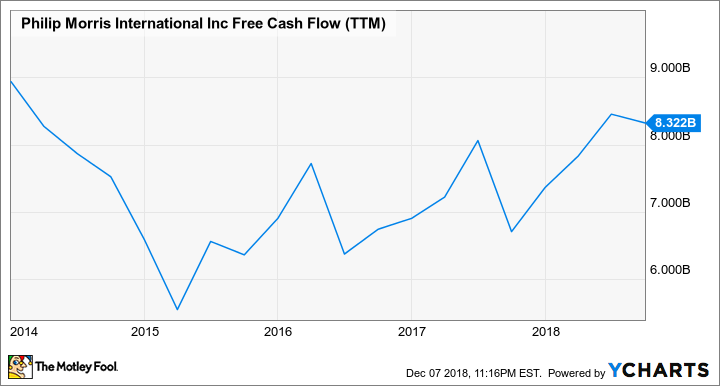 Over the past 12 months PMI spent 101% of its earnings on its dividends, but the payments only used up 81% of its free cash flow (FCF). Unlike Altria, PMI hasn't spent any of its FCF on stock buybacks (due to volatile exchange rates) for over three years, and its FCF growth has remained fairly steady during that period. Analysts expect PMI's adjusted earnings to rise 5% to $5.30 next year, which would comfortably cover its forward dividend of $4.56 per share with a payout ratio of 86%. PMI's dividend looks sustainable, but Altria pays a higher forward yield of 5.8%, and spent just 72% of its FCF and 48% of its earnings on that payout over the past 12 months -- which arguably gives it more room for future hikes than PMI. PMI sells cigarettes overseas, while Altria focuses on the domestic market. That's a double-edged sword for PMI: It allows the company to seek out higher-growth overseas markets, but its growth is frequently throttled by unfavorable exchange rates. Many of PMI's high-growth markets, like Indonesia, are also introducing tougher anti-smoking regulations. Meanwhile, British American Tobacco's takeover of Reynolds helped it surpass PMI as the biggest publicly traded tobacco company in the world. As a result, some analysts believe that PMI might need to buy Altria to remain competitive -- but doing so would sacrifice its streamlined focus on overseas markets. On the bright side, PMI's total shipments are rising (after excluding the net impact of trade inventory movements), its retail market share grew from 38.1% to 38.4% between the first nine months of 2017 and 2018, its revenues rose on a constant currency basis across all its regions last quarter, and lower manufacturing costs for cigarettes are boosting its operating margins. That compares favorably to Altria's ongoing declines in shipments and market share losses in the US. PMI also remains immune to the FDA's latest plans to tighten anti-smoking regulations in the US, which could throttle sales of e-cigarettes and flavored cigarettes (including menthol) and limit nicotine content for all products. PMI is also offsetting softer demand for its flagship Marlboro brand with the growth of secondary brands like L&M and HEETS heatsticks for its iQOS devices, which electrically heat tobacco instead of burning it. That's why Wall Street expects PMI's revenue to rise 3% next year, compared to just 1% growth for Altria. Is PMI an undervalued income stock? PMI's forward P/E of 16 is still higher than Altria's forward P/E of 13, and it isn't that low relative to its single-digit earnings growth. Looking further ahead, analysts expect PMI's adjusted EPS to grow at an average rate of 8% over the next five years. That gives its a 5-year PEG ratio of 2.2, while "undervalued" stocks generally have PEG ratios below 1. Altria has a much lower 5-year PEG ratio of 1.4. Therefore, I wouldn't call PMI a cheap income stock yet. It isn't expensive, but the company still faces shifting headwinds and a gradually shrinking core market. Therefore, I'd stick with more stable income stocks like AT&T -- which offers a higher yield at a lower valuation -- instead of tobacco plays like PMI and Altria.